Have a Heart on Valentines! 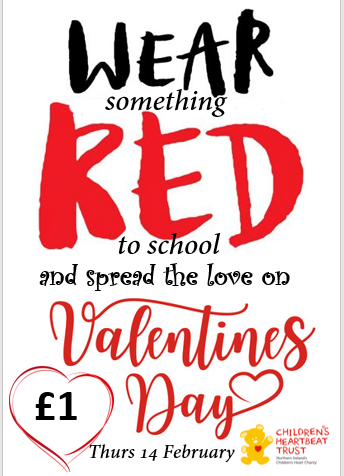 Everyone is invited to wear something RED with their school uniform to school this Thursday, to show our support for Children’s Heartbeat Trust. A red scarf, tights, shoes, laces, hairband, tie, sunglasses or even a heart on your sleeve! Senior students will be making a bucket collection – so please give generously – have a heart this Valentine’s day!